Recently had a colleague that ran into an issue with an Exchange 2010 migration. He could fail over the mailbox databases with no issue to DR, but that’s where the trouble started. The production database would start to report that there was a high copy queue length that would increase as more activity occurred on the DB. The production database pure and simple was not receiving the transaction logs from the newly activated database in DR. The setup was simple, two nodes, one in production, one in DR with a FSW. 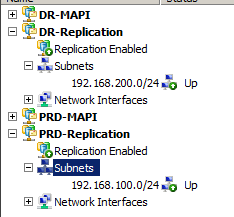 The nodes were all-in-one 2010 boxes, with one NIC for MAPI and one NIC for replication. Everything went back to normal!